Having sworn allegiance to Byzantium, the army of the First Crusade crossed into Asia Minor in May 1097. At Nicaea and Dorylaeum, they won two resounding victories against the Turks, capturing their capital and opening the road south towards Jerusalem. Through July and August, in the face of burning heat and hunger, the crusaders swept aside all resistance as they marched almost a thousand miles across the steppes of Anatolia. Outside the ancient city of Antioch, however, their progress halted: the Turkish garrison was all but impregnable, and as winter drew on the army was devastated by rain, disease, starvation and battle. By February 1098 they had suffered five months of attrition to no discernible gain. Rivalries festered between the different nations of the crusade – Provencales from southern France, Germans from Lorraine, Normans from Sicily and Normandy, and Byzantine Greeks. Fractious princes grew jealous of each others’ ambitions, while the miserable mass of foot-soldiers and camp-followers seethed at the failure of their leaders to deliver them. And in the east, the Turks began to assemble an army which would crush the crusade once and for all against the walls of Antioch. After Mosaic of Shadows, there were two directions the series could go. One was to stay in Constantinople and focus on Demetrios as a detective, like Lindsey Davis's Falco, which was the original intention when I began the series. The other was to pick up on the crusader theme which had muscled itself into the first book and follow that to its inevitable conclusion. I was keen to work with a broader historical canvas, and excited by the extraordinary story of the First Crusade - particularly the siege of Antioch. I also felt that I hadn't achieved everything I wanted with Mosaic, that I wanted to write something with a bit more heft, to explore some of the ideas and ideals of that period. And so I, like Demetrios, took an unexpected turn and set out with the crusaders on the road to Jerusalem. The novel takes place almost entirely during the siege of Antioch. This is the sort of event that historical novelists pray for: an almost unbelievable sequence of desperate sieges, midnight raids, ruthless ambition and epic battles. Unlike many historical events, it fits neatly into an archetypal story shape. There's a promising beginning which gives way to frustration and danger; a dramatic battle in the middle which brings only temporary respite; a new and even more dangerous enemy; and finally, a climactic battle that brings a decisive victory. Given this setting, there were two elements I wanted to add. One was to do with plot:Knights of the Cross is now (rightly) published as general historical fiction, but when I started writing it was conceived as a crime novel. Hence, I needed a body and a murder plot. Secondly, I wanted to examine how the crusaders' faith - their faith in God and their belief that He had guaranteed victory - bent and twisted under the pressures of the siege. In Knights of the Cross, different characters face the awful possibility that God might actually have failed them in different ways, which Demetrios gradually discovers as he investigates the murder. The crusaders are in a sort of purgatory, a lot like the Israelites in the wilderness after the flight from Egypt, and not all of them survive with their souls intact. 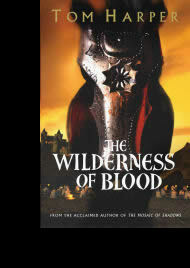 It was these two ideas, the testing wilderness and the bloody murder it leads to, which I tried to capture in the novel's original title: The Wilderness of Blood (shown above on an early draft of the cover by Chris Moore). The novel opens during the dark days of March 1098 when the crusade seems to have run out of steam. Demetrios Askiates is there as part of a Byzantine detachment which is intended to guide, help and watch the crusaders in equal measure. Tensions between the different factions among the crusaders are almost at boiling point, and when a Norman knight is found murdered, Demetrios is one of the few men with the neutrality and the experience to investigate. You can read the first chapter of Knights of the Cross here.